For salmon, Bristol Bay is like a warm reception hall. Every summer, after years of navigating the wild waters of the Pacific Ocean, tens of millions of salmon arrive, seeking entry to the freshwater rivers that flow into the Bay. The fish surge upstream, instinctively navigating the clear waters of the intricate network of streams and lakes where water flows freely for miles and miles. In this pursuit to spawn, salmon also form a cornerstone to a natural cycle that supports whales, birds, brown bears—and people. Of the five salmon species fished in Bristol Bay, the sockeye fishery alone is worth $1.5 billion each year. In fact, nearly 20,000 jobs throughout the United States annually depend on the health of this run. 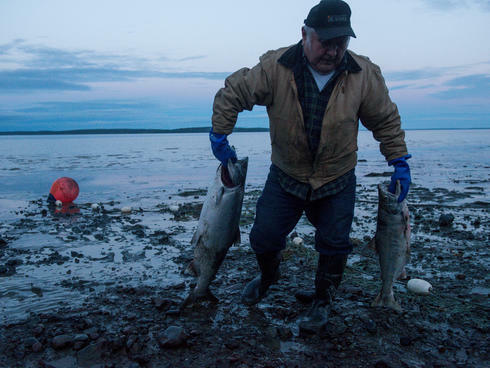 Beyond the economic benefits, some 4,000 Bristol Bay locals, including many native Yup’ik and Dena’ina, depend on these fish, along with other subsistence foods for 80% of their protein. These fish form an integral part of the food chain for wildlife, from the offshore ecosystem of Bristol Bay all the way up to the headwaters. While belugas and orcas hunt offshore, brown bears and eagles in the tundra and hills above fish for their next meal. Even in a lake hidden hundreds of miles away in the bay’s headwaters, one of the planet’s only population of freshwater seals feast on the salmon. These fish are the red blood cells that bring life to this region, the rivers the arteries that carry them. When those arteries become poisoned, then the system starts to break down. Now a proposal for a large, open-pit copper and gold mine risks ruining the natural resources that people and wildlife have relied on for centuries. 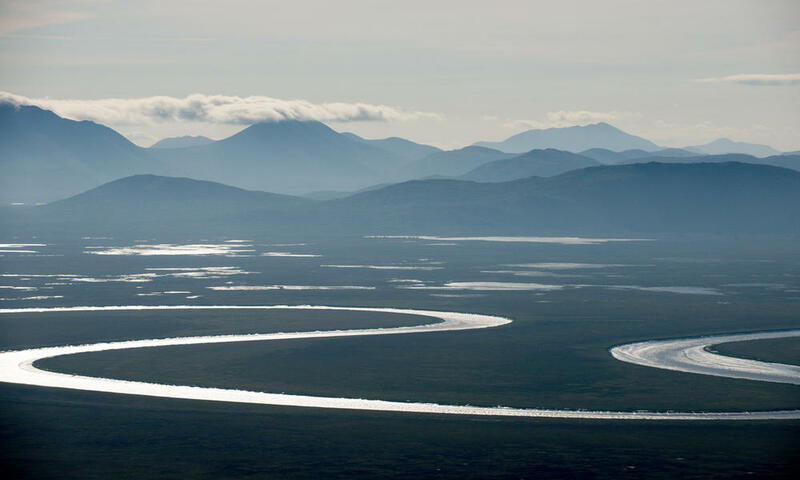 The Pebble Mine would extend one-mile-wide and a quarter-mile deep, destroying over 3,000 acres of wetlands and more than 21 miles of salmon streams. The infrastructure required to construct this mammoth mine would also disrupt this intact, free-flowing network of rivers that brings the entire watershed to life. 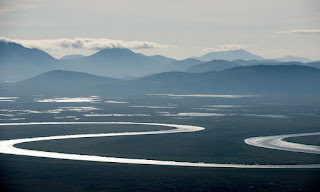 For example, the current project calls for a road more than 80-miles long crossing more than 200 streams with a port facility at the end of it and a two-mile long dock into a shore of Bristol Bay that’s known habitat for an endangered population of Beluga whales. In addition to the calamitous infrastructure, the tons of acid mine waste generated from this temporary extractive enterprise would pose a direct risk to the health of the bay and its headwaters, as well as the globally important fishery that swims in them. Disruptions to the hydrology and ecosystem health would harm the local economy and people with global ripple effects. 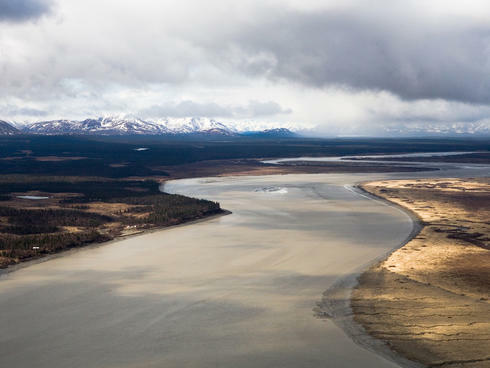 The US government is attempting to fast track the permitting process for Pebble Mine, a development that the US Environmental Protection Agency warns would cause irreparable, damaging impacts on both people and nature. In fact, the EPA found in a scientific study that, even without a mine disaster, construction of the Pebble deposit would destroy 94 miles of salmon streams and 5,350 acres of wetlands, lakes and ponds. To protect the health of the ecosystems, wildlife and communities dependent on these connected waterways, WWF is educating the US government about the importance of the bay to Alaska and the rest of the U.S. We are also partnering with in-region organizations to amplify the voices of local communities and Native voices as well as promoting support for a sustainable economy that lasts well into the future. People from around the world are vocalizing their opposition to the project, citing the unparalleled ecological value of this region. Impalas cry wolf, so say zebras!